Ostanding is the leading online manufacturer and supplier of custom made shades. Roman and roller shades offer a relatively cheap and user-friendly option for draping your windows. The best feature of our customized shades is that these are created from the finest material and in perfect accordance to your needs, demands and imagination. You can truly trust on our expertise in the field of customized roman and roller shades. Here is how to order a shade from Ostanding. In this category you will see two options Roller Shade and Roman Shade. We can create a roller or roman shade both and it all depends upon your preference. Currently we are emphasizing on roller shades and encourage our customers to opt for these. However, before deciding about the type of shade, you have to understand the difference between roller and roman shades. Roller shades are window blinds that involve a mechanism of rolling up when you don't require it to be hanged down. This is done through a device that is installed on the top of the shade. Usually these kinds of shades are created from a hard or solid material so that rolling up and down is easily done and the shade is not harmed. You can order from a vast range of Roller shades from light filtering to complete blackout facilitating ones. Roman shades on the other hand can be crafted from all sorts of materials and when hung these do not stack up like the customary curtains. We offer a wide range of materials from natural woven to fabrics and there are lots of creative designs such as pleated ones. These can be installed at almost any style of window and room and with our excellent digital sublimation oriented printing facility, what you get is an interesting embellishment for your place not just a window blinder. You may not be aware about it but windows also have different styles and kinds which is why we need you to be specific about your style of window. To help you out we provide you three options: Landscape; Square; Portrait. Landscape window will be slightly elongated and rectangular in appearance; Square will be having exact same length and width on all its four sides and Portrait will be longer from top and side will be a bit squeezed like a portrait. photograph. After selecting the width and size of your window you will have to select the kind of fabric you want as well as the color of your roller shade. It is an important decision because the impact of an image gets enhanced tremendously if you pick the right material. We currently offer two types of roller shade materials: Plastic and Polyester. For colors you can choose from a wide range of palette as per your liking. It is our guarantee that the dye will be perfect and in complete accordance to your order. That is because we employ state-of-the-art techniques in fabric dye instead of sticking to conventional ways. If you are uploading an image then the colors will be determined according to the picture provided. Polyester and plastic are the most highly preferred of all material choices in roller shades. It is a fact that once you get the material dyed, the end result may vary from the color of your choice. However if you use polyester or plastic then the shade will be perfect after being dyed. Moreover the image quality will be extraordinarily appealing on these two types of material. The reason behind picking these two as our favored choice in roller shade printing is that these tend to be durable. Another aspect is that the printing job is conducted immaculately on both polyester and plastic. These are materials that can easily be lowered down and pulled up without the fear of getting it damaged. You can totally rely on plastic and polyester but the choice must be made after evaluating the area where you will be installing the shade. If the area receives a lot of dust or sunlight such as lounges then plastic will be a good choice. On the other hand if this is not the case then polyester should be preferred. Once you have made up your mind simply click on any one of the two available materials and move forward to image selection. You need to be specific in this regard because if you do not provide the accurate length, breadth and width of the window for which you are ordering a roman shade, the entire effort will be fruitless. In this category you will see two options Width and Height. The measurements entered are required to be in inches and please use a professional measuring tape for evaluating the exact height and width of your window. It is important to note that we make blinds with inside mounts and for creating one you have to provide accurate measurements. 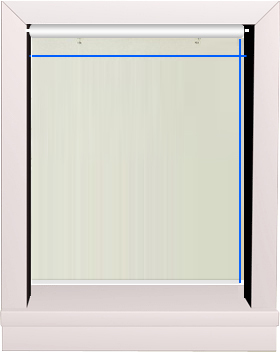 An inside mount is basically the measurement specification that is required to manufacture a window covering which is later fitted inside a window casing. To allow proper functioning of the window covering within the window casing, a standarddeduction is mandatory in the measurement, which will be done by the manufacturer. For measuring always use a steel strip.First measure the width of the window in three positions: top, middle and bottom edge/sill. Note down the narrowest of these measurements for your inside-mount.After width, you need to measure the height in three different positions: left, centre and right. Note the longest length from all three measurements. Make sure that the measurement noted is nearest to 1/8inch and never round. This may seem like the best part of ordering a roman shade. However, this is also the trickiest because even the slightest of mistake can cause you extra expenses and can sabotage the entire look of the shade. For measuring the pixels a DPI (Dots per Inch) formula is utilized. In case you are wondering what DPI is all about then let us inform you that a pixel represents the number of points that get captured from a digital camera. However, since the highly advanced digital cameras of today can capture thousands of points therefore, to shorten the number of points a Megapixel formula is used. When a digital image has to be printed via a scanner or printer the individual color points are called dots and not pixels. Since every output from a printer is measured by inches that's why the term Dots per Inch is used to evaluate the exact physical size of every pixel. Scanners perform this function in reverse order, which means that the color points of any items under scanning are determined by row and column. For your convenience we are mentioning the DPIrequirement and the method of calculating it. Ostanding roman shades are operated through a chain system mechanism and sidewinders clutch in which the loop chain is fitted with a breakaway connector. This system is not just more user-friendly but also safer to be used if there are children around. You can choose to install the chain at either the left side or the right and this decision depends upon the side you feel most convenient with. Similarly, sidewinders can be of various colors and therefore, we have listed all the trendiest colors for your convenience. All you need to do is choose.